The TJ2242A is single-channel High-Side MOSFET switch optimized for adjustable current limited power distribution requiring circuit protection. The TJ2242A series support the following USB requirements. The TJ2242A series supply up to 2.25A as required by USB downstream devices. Maximum continuous current can be different on the types of package and ambient temperature. Switch's low on-resistance meets USB voltage drop requirement. Flag output indicates fault condition to the local USB controller. Soft-start prevents the transient voltage drop on the upstream port that can occur when the switch is enabled in bus-powered applications. Under voltage lockout feature disables the output switches until a valid input voltage. Auto discharge function quickly lowers the VOUT to the ground level when the TJ2242A turns off. 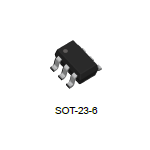 Also the TJ2242A includes thermal shutdown to prevent switch failure from high-current loads and reverse current protection circuit to prevent the reverse current from VOUT pin to VIN pin.